I found a wonderfully beautiful food blog called Grilled Cheese Social, and I have started saving a bunch of the recipes to make. 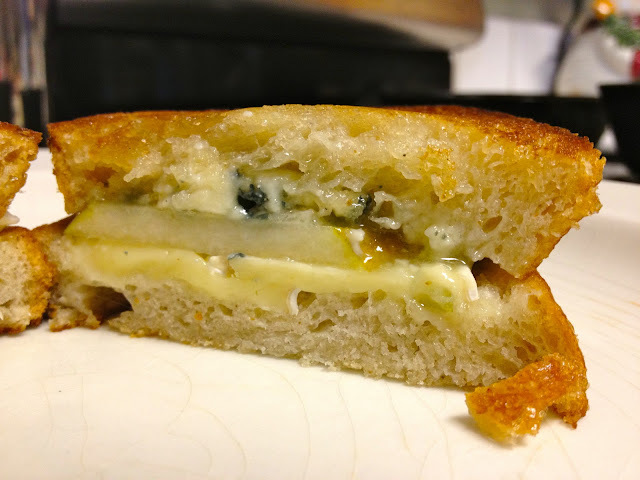 I tried making one, which is called the Little Boy Blue, and it's a grilled cheese consisting of pears, blue cheese, brie, and honey. On the blog, the recipe calls for certain types of cheeses, which I just couldn't find, so I substituted, but I think mine turned out a little strongly flavored. The blue cheese I used overpowered all the other flavors. It may have turned out better with some gorgonzola instead. But no matter, here it is! 1. Take one slice of bread and pile on a few pieces of pear. 2. After that, gently sprinkle on some of the Blue Cheese. 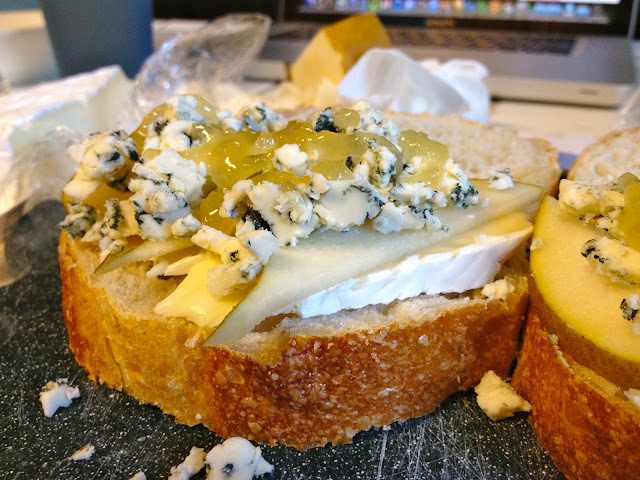 If it falls off the sandwich, don't worry - the next step will help keep the blue cheese on. 3. At this point, drizzle on some honey. 4. Just put on the top piece of bread and smear a pat of butter all up in those delicious little nooks and crannies. Then once your sammie is built, go ahead and melt the other pat of butter in your skillet by turning the heat to medium. Then when it's melted, gently place sammie in and try to sop up all the butter. 5. Once it's ready on one side, gently flip the grilled cheese and brown the other side as well. 6. Then when evenly golden and crispy on each side, take it out of the skillet and serve while it's all hot and gooey!